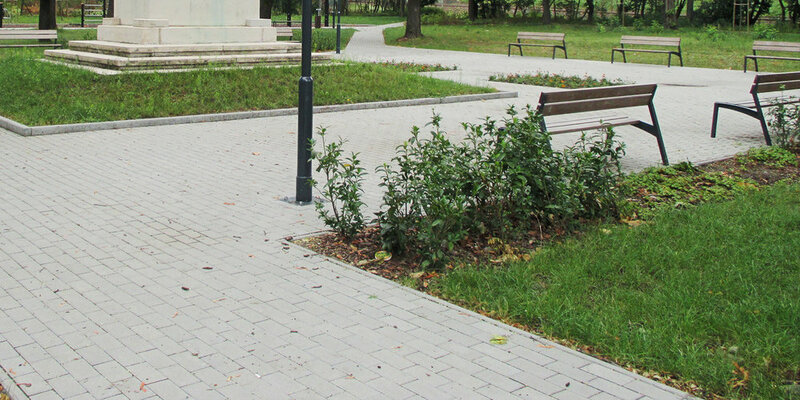 Promoting community collaboration and connectivity was one of our priorities for the design of the playground on Gagarin Street in Mágocs, by creating orientations, emphases and logical access routes from each direction. These vibrant promenades connect a number of reception squares, emphasizing the feeling of arrival. The shared play spaces consist of smaller pocket squares with seating surfaces and furniture. While the playground design meets the requirements of EU standards, our aim was to create a playfield with a cheerful community feeling where locals have a sense of belonging, a shared identity. Filling the area with functions will improve life quality on the long term, may stimulate socio-economic growth, and help with the migration trends of the settlement. Located in District XVI, Budapest, Cinkotai leisure park becomes a public meeting place for residents and youth of the district, providing a pleasant passage, featuring a variety of outdoor sports equipment to promote physical well-being. It makes its contribution to improve community life and strengthen social relationships. The WWI monument dominating the space is complemented by a paved resting area. The left bank of brook Caprera is structured into terraces of stone blocks to make the water and the transitional vegetation accessible. To invite wonder and interest new trees and plant surfaces are designed, keeping the importance of the park's transparency in mind. 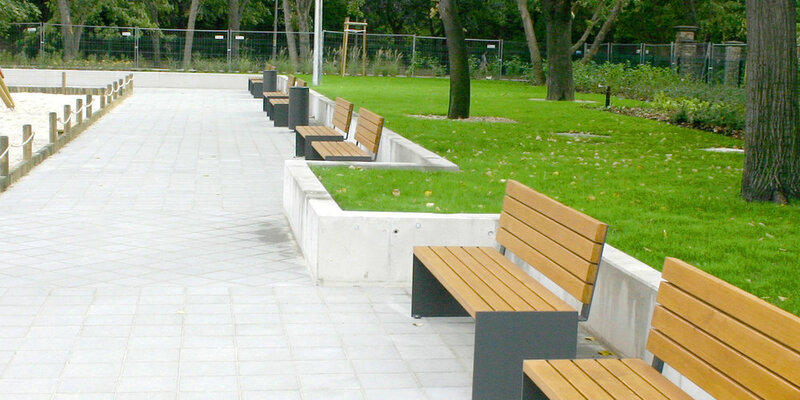 Modern street furniture and metal fitness equipment add further interest to the park. New candelabras are arrayed along the central hub and its main traffic directions. The memorial is is also illuminated within the framework of the rejuvenation works. We designed an extreme sports park in Jászberény using the existing elements of the former ice rink. The layout of the area is adapted to extreme sports and provides space for additional elements (graffiti wall, meeting place). The elements of the track were constructed with an additional concrete coating over the existing structure. We designed wooden seating areas where spectators and athletes can both relax, and secured an empty asphalt surface where trials can build the required infrastructure. This interface can also be used for seasonal concerts and award ceremonies. The rejuvenated sports park, besides being attractive to athletes, must also serve as a meeting point for youth. The main goal was to create a popular, youthful, modern area. To make users feel at home, we placed mobile street furniture that can be transformed, moved to their own needs. The sports park is also equipped with a free climbing wall and an outdoor trampoline. 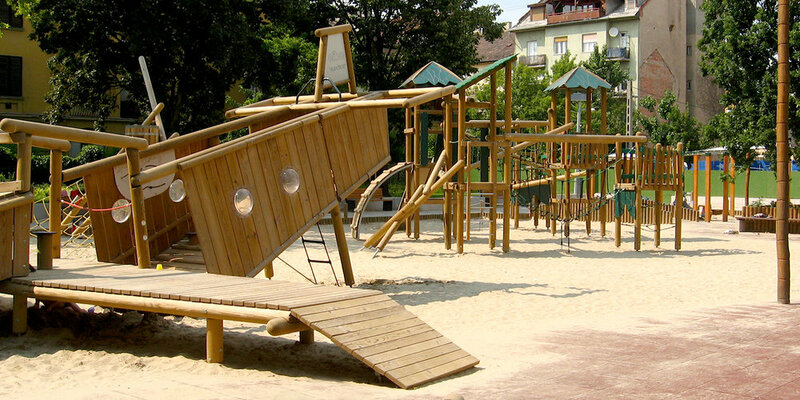 By commission of the Municipality of Budaörs, we designed a kindergarten playground located at 17 Rózsa Street. The design area has two distinctive parts, the green area to the right of the main entrance and the U-shaped courtyard. The courtyard’s renewed asphalt pavement is coated with a playfully colored paint layer, while the playground is covered with a rubber pavement. The existing two sandboxes are allocated within the garden, trees and other vegetation are placed in planters. The outer courtyard’s size proposes a larger green surface. The sandboxes and smaller sprint games are placed in its central lawn area. Delimited by a hedge, the swing and a playcastle provides a safe and cheerful playing environment. The goal of the design was to create a nursery school garden where the children would have a greater opportunity to come in physical contact with their environment. The garden was designed to provoke, stimulate and involve children in their adventure to find the answers through experimentation. In addition to the nursery's standard and customized requirements, there are countless additional stimuli and discoveries whether it's during entering the kindergarten or leaving back home in the afternoon. The entrance area is a unique environment of welcoming and saying farewell, the gateway to new adventures. To support this transition, we placed several play units so that parents and children can share these experiences. In shaping the building and its courtyard it was of primary concern that each group room has as much access to the courtyard as possible. The group rooms on the upper floors are open to the garden while the outdoor events space connects to the building’s first wing in the first courtyard. The two levels are connected by a sloping system that offers the experience of running, sledging and roller-skating. Water and sand-based play furniture teaches children about cooperation, performation of shared tasks. Balancing tools bring new challenges to the children, while dollhouse-type tools help develop communication skills. In the interest of awakening the senses of children, they can find several types of material in the garden. Touch, sight, hearing are stimulated by vegetation and play equipment. 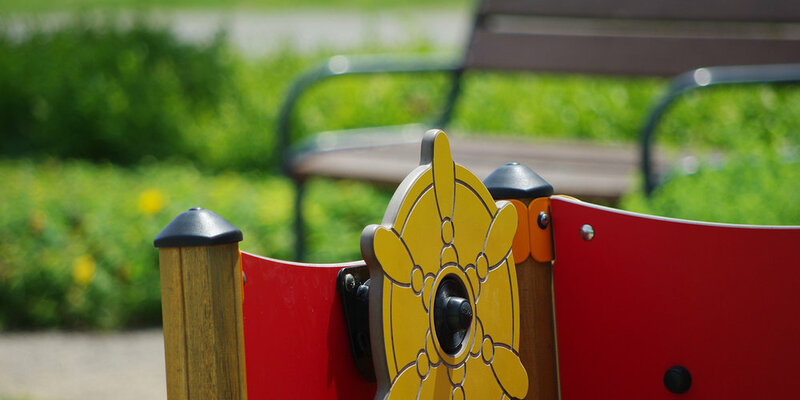 When designing play equipment, it was essential for children not only to get ready-made products and shapes, but also to find toys that can be used for various purposes. The complex educational center designated by the Municipality consists of 24 primary schools, music schools, 6 kindergartens, sport and event halls in the southern part of the town in order to serve nearby residential areas. Korzó took its part by creating the spatial design of the adjacent open spaces. The principle of design was to create a tight, yet somewhat playful, free spatial structure fit for the building. 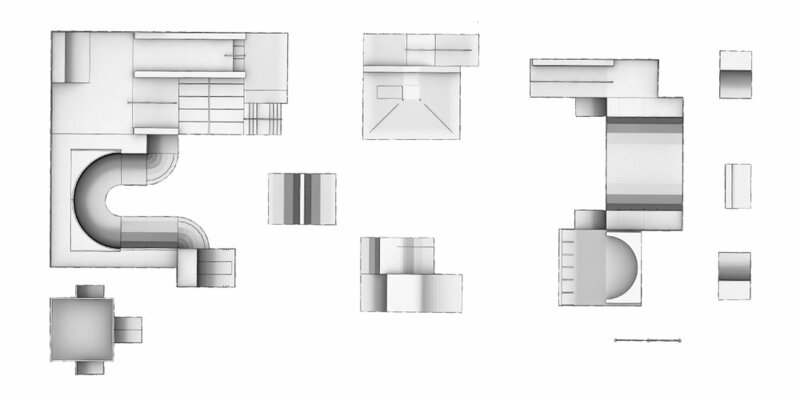 These free-formed, individual spaces aim to give room to the emergence of different modes of use. The whole design area has been designed in a uniform style and perspective. In terms of different functions we allocated a reception area, a school garden and a nursery garden. The reception area is the entrance hall of the school, where the parking lot can potentially transform into a venue area. The school garden is divided into a playground, a sports hall, an outdoor concert hall, a backyard school subdivisions. These spaces encourage students to work and socialise, encouraging interaction and idea exchanges across the disciplines. The secluded nursery garden is shielded from the other open spaces by the kindergarten building. Lead designer: HAP Tervezőiroda Kft. When designing this newly built playground, we aimed to create a harmonious composition with its environment in both function and style. The hosting Fáy mansion-garden – located behind the mayor's office - is an English garden with baroque features. 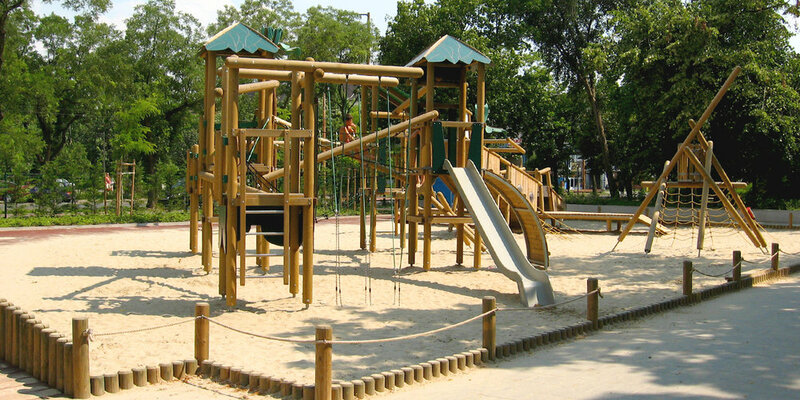 The playground draws from the style of typical landscape gardens accordingly. The presence of playgrounds always has a positive effect on local community life. The surroundings of the mansion also become filled with life, decreasing the risk of potential damage to the monument which potentially becomes a landmark of local community awareness. The planned investment promotes the preservation of the built cultural heritage. The establishment of a refined green space- playground complex has a stimulating effect on social sensitivity; besides improving cooperative and problem solving skills, mental and physical integrity, and stamina of children and youth in the neighborhood.